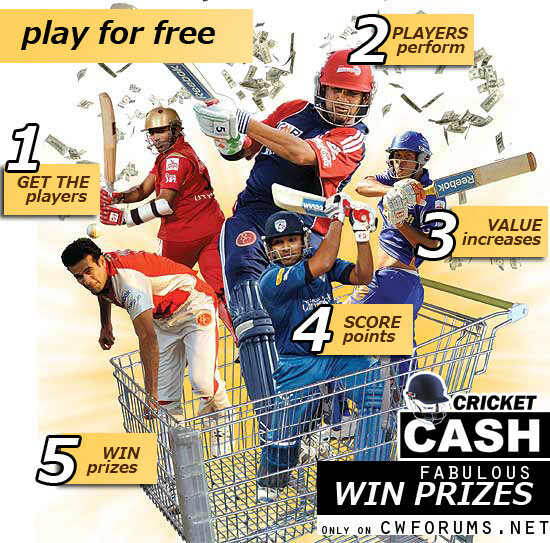 Cricket World proudly presents a brand new game for all it's fans. And this time, Cricket World gives you the chance to win loads of prizes which makes it the first game which has got prizes up for grabs. Every month, a player's list will be generated based on international cricket fixtures. Each player will have his own Rating at the start of the month. A player can be picked by one participant only. The player's Rating will now increase/decrease based on his performance. The participants can trade their players during the trade window that will be open every Sunday. At the end of the month, the participant with most points in his team will be declared as winner. Runs scored and century made by bowler won't be counted. Wickets taken and 5W haul of batsmen won't be counted. Details regarding player selection and enrollment to be posted soon. Mithun Nambiar wrote: Is this still on?